Separate the broccoli florets from the stalk and cut them into smaller, bite-sized pieces. Cut the remaining stalk in half and finely slice. Place in a serving bowl, together with the onion, pomegranate arils, raisins and sunflower seeds. Toss to combine. Add the yoghurt, salt, and pepper, to taste. 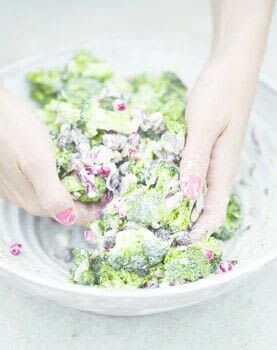 Use your hands to mix together making sure that all broccoli florets are coated in yoghurt. Serve. Tip: The traditional way to make this salad is with mayonnaise. Our version is lighter but you could use mayonnaise instead or use half and half. Tip: For a vegan alternative, use soy yoghurt.